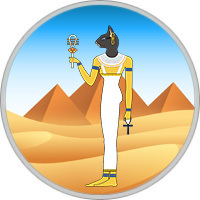 Bastet Dates: July 14 – 28, September 23 – 27, October 3 – 17. Traits of Bastet people: Equilibrium, Anxiety. Lucky Colors: Yellow for men, Gray for women. Bastet (sometimes called Bast) — the goddess of love and joy, female beauty and a home. She was portrayed as a woman with the head of a cat or a lioness. It symbolized two aspects of Bastet — she could be both kind and loving, and aggressive, able to protect his family. She was considered a defender not only of the pharaohs, but of all mankind. Bastet’s wards are ideal wives and mothers. In any women’s profession, they will easily succeed. It is best for them to realize themselves in pedagogy, medicine, accounting. From them beautiful seamstresses, designers and florists, secretaries and nurses turn out. In addition, they are deliciously prepared. If a man was born in this period, he should try himself in the profession of a doctor or healer, a teacher or even a psychic. The ability to relieve stress and soothe is their natural gift. They are surrounded by a soft and curative aura that warms everyone around. They will find for everyone exactly those words of comfort and encouragement that will be appropriate. Also, they subtly feel the state of others, at first glance, are well versed in any situation. Friends appreciate them for their insight and well-developed intuition, and often turn to them for advice. Gracefulness and charm of children Bastet attracts many fans to them. However, due to innate caution and prudence, they are not in a hurry to decide the choice. Sometimes they pull so long that they miss the right person. If they still find their loved one, they will surround him with special attention and care, give him unlimited love and loyalty. The Bastet man should open his heart, try to overcome shyness. People are drawn to such personalities, they are able to talk beautifully, and are always good-natured. Thanks to the developed intuition, the Bastet male seems to see a person through and through, and always tries to help. Such persons feel boundaries that can not be crossed under any circumstances. For them, it’s not a problem to pick up sincere words, they always come from the heart. If you need advice, feel free to contact Bastet. The Bastet woman tries to find a soul mate who understands her from a half-word. She is looking for a partner with whom there will be complete harmony and mutual understanding. She treats relatives with tenderness and warmth, tries to give the family more time. Bastet woman always has something to talk about, she is an interesting companion with a broad outlook. Such persons tend to limit their circle of communication and if you enlist its support, then your friendship will go through all the sorrows and adversities. A charismatic person who needs to be trusted by people.